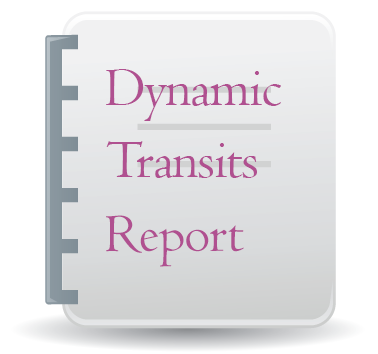 Find out with a Dynamic Transits Forecast Report, personalized for your birth data. This computerized report examines the next four years in terms of “outer planet transits”, including the transits of Jupiter, Saturn, Uranus, Neptune, Pluto, and Chiron to your chart. These are not daily trends, but rather long-term trends that are influencing your life. Date ranges for the influences are given. This report is based on the transits of Jupiter, Saturn, Uranus, Neptune, Pluto, and Chiron by house and aspect to natal planets. 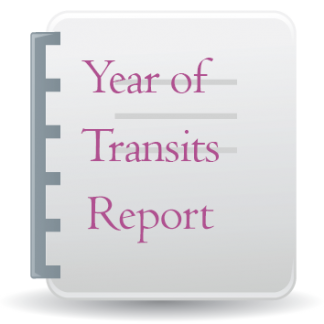 This computerized report examines the next two years in terms of “outer planet transits,” including the transits of Jupiter, Saturn, Uranus, Neptune, Pluto, and Chiron to your chart. 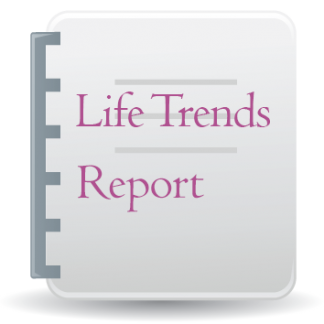 These are not daily trends, but rather long-term trends that are influencing your life. Date ranges for the influences are given. See for yourself what this report has to offer: Dynamic Forecast Report SAMPLE. 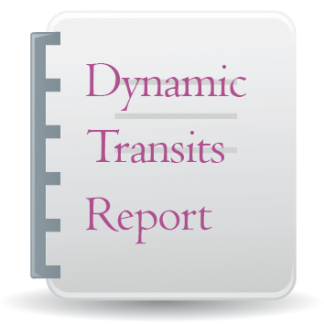 Features/Limitations of this report: Note that due to retrograde motion, the outer planets can move in and out of the same house, sometimes travelling back into a previous house, and you may see repeated interpretations when this occurs. Due to retrograde motion, some aspects also repeat, and if this is the case, you’ll see the interpretation of that repeated aspect more than once. Dynamic Forecast Report for Four Years is $4.95 US, and is delivered by email via an attachment usually within 24 hours of order placement as well as full information requested. 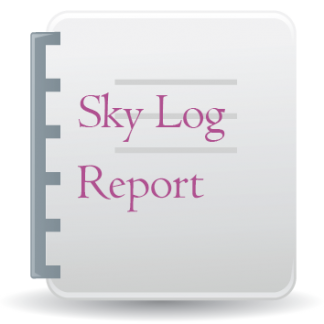 Note that you will not receive the report instantly, as it is not generated online. The report will be cast for four years, starting from the first of the month on the date of order placement, unless you specify otherwise. Note that there are 5 details required for this report: Your name (it can be a first name only, if desired), birth day, birth time, birth place, and current place of residence. Note: This report is designed for a known birth time. However, if you state that your birth time is unknown, it will be run as a solar chart, with the Sun on the Ascendant. #DTF $4.95 US Dynamic Forecast computerized report delivered through email usually within 24 hours of receipt of payment AND full information required to generate the report. Please enter your name (can be first name only, if desired), your birthdate, your birth time (example: 7:36 PM – do not adjust for time zones! ), birth place (city, state/province, country), and your current place of residence (city, state/province, country). The current location is required so that the times included in the report reflect the correct and current time zone. See the full PDF sample here. The subject of Fate or Destiny has triggered many a philosophical argument. What is destiny? Are the details of our lives pre-destined? How much free will do we really have? These are imponderable questions. This report does not offer the answers. Rather it gives us some signposts to help us on our life journey. When meteorologists forecast the weather we understand that they are not telling us how to live our lives. Rather they are giving us information that may help us make our own decisions. As far as the weather is concerned our major decisions are whether or not to dress warmly or to take an umbrella. The astrological system of Transits is offering us much the same information. It is giving us an indication of the emotional and intellectual weather of our lives. It is up to us to decide our own destiny. When using this set of interpretations, please bear in mind that, inevitably, every chart will contain some contradictory influences, and as a result certain interpretations of different items in the same chart may seem difficult to reconcile. However, this may still be an accurate reflection of what is happening to the individual whose transits are being interpreted, as people do experience conflicting desires, events and circumstances in their lives. It is the responsibility of the astrologer to synthesise these apparent contradictions in order to present a cohesive and realistic interpretation of the dilemmas of the chart. Each entry in this list relates to an astrological event that affects the natal chart for this individual. The entries are sorted by the exact date on which each event occurs, and the period of time around this date during which the events are considered to be in effect is shown in parentheses on the same line. Note that due to occasional retrograde motion of some planets, some events may be exact on two or more dates, and in this case all such dates are listed on the same line. Any events which are not exact within the report period, but whose period of effectiveness overlaps with the report period are also included. TRANSITING PLUTO TRINE RADIX MIDHEAVEN – Right now you are able to evaluate your direction in life and make adjustments to help you stay purposeful. You may not realise it but you are changing in ways that will enable you to achieve your ambitions, particularly in the area of career. You are becoming aware of the power you have to affect the world, particularly through your career, and perhaps even parenthood or marriage. Opportunities may arise to give you an outlet for this newfound sense of power. You may be promoted at work or receive the recognition that you have always wanted. It is also possible that you now have the chance to move into a new job that better suits your particular talents. Either way you feel powerful and capable of tackling any task that furthers your life purpose. You may also meet an influential person, perhaps a potential business partner, professional colleague or prospective marriage partner. Enjoy your sense of capability and use your influence with integrity and this can be a very positive period. TRANSITING URANUS SEXTILE RADIX MERCURY – Your mind is more alert and your speech rapid during this time. You may also be presented with opportunities to express your ideas. TRANSITING JUPITER OPPOSITION RADIX CHIRON – Life lessons are learnt when these two entities combine. You are likely to learn more when you relax and have a positive mind set. This can be a painful time during which you feel hurt by someone else’s actions or by an external event. It can also be a period during which you heal. You may feel that you are being forced out of your comfort zone and required to grow in ways that you would rather not. It is also possible that this current pain has triggered memories of childhood hurts, which you had hoped to bury. While this is difficult and can leave you feeling quite powerless at times, you would do well to face the situation and move through it with strength and courage. Of course you can always ask for help from compassionate friends or professionals. Your challenge is to heal wounds from the past which may be subconsciously inhibiting the full expression of your talents now. Faith and hope are your friends right now. By the end of the transit you have been presented with the opportunity to discover new treasures. TRANSITING CHIRON TRINE RADIX URANUS – Now is the time to take a chance and explore new and unusual experiences, to tackle life’s problems in an inventive and original way. You are eager to branch out and express your true potential with your sights keenly focussed on the future rather than the past. You feel alive and energetic, prepared to venture forth into unexplored territories, particularly those involving metaphysics, science and computers. And chances are that you will be presented with plenty of opportunities. You may even discover healing or teaching talents that you never knew existed. Make the most of these energies while they last, although do not throw caution entirely to the wind. TRANSITING JUPITER OPPOSITION RADIX MIDHEAVEN – It is time to reap the rewards of a comfortable home and loving family. This is a beneficial time for achieving your personal goals with a view to making life more comfortable with the help of your family. You are likely to enjoy the support of your family during this phase, either from close family members or through expanding your relationship with extended family members. A relative may come to stay with you encouraging a fresh approach to your life. Alternatively you may decide to have children, or give birth to a child during this phase. Changes in your home life are likely to be beneficial, giving you increased opportunities for a sense of well-being. You may also make changes to your home. For instance you may renovate your home including more space for relaxation and hobbies or you may clear out cupboards, rooms, storage areas thus paving the way for more enjoyment at home. Alternatively you may feel the urge to move to larger and more accommodating house or invest in property. Grown children may leave home giving you a sense of more space and freedom (even if you have a few tears as well). Whatever plans you make your efforts to improve your home environment and family relationships are likely to have benefits for your general sense of well being and thus benefit all areas of your life. This is a positive period. TRANSITING NEPTUNE SEXTILE RADIX CHIRON – Opportunities for creative pursuits arise during this period. Peace and solitude may be the theme, as you feel the need to slow down and reflect on your life; however, you could also be busy pursuing avenues for expressing your many talents. It does not matter whether you are busy or enjoying a peaceful pace of life. More importantly you are doing what comes naturally. This is a very healing time. TRANSITING JUPITER SQUARE RADIX MARS – You have plenty of drive and energy right now. This can be directed in to personal or work projects or perhaps a sport. You are keen to take the initiative and move ahead with your plans. Perhaps you have been planning to travel abroad or to study martial arts? On the other hand you may have been waiting for the go ahead on a special project or for a promotion at work. Now you receive the good news and are able to step into action. You are clear that you are heading in the right direction and feel confident of success. And it’s true. You do have the drive and good fortune to achieve success during this stage. This is an excellent time to spend plenty of time and energy on your favourite project, with an assurance of reaping what you have sown. You may also enjoy channelling some of your energy into your favourite sporting activities. However, during this phase you are in danger of going over the top in your efforts to achieve your personal goals. You may jeopardise your success through impatience with yourself and others, thus alienating those who are in a position to support your goals. Perhaps you are having difficulty seeing things in perspective and fail to listen to those closest to you when they say that you are being a little rash and stubborn. You feel that you have put so much time and energy into certain areas of your life, and now others are threatening your success with their unnecessary pessimism. This may or may not be true. It is possible that others are threatened by your success; but it also may be that you need to slow down a little and exercise some restraint. The lesson is all things in moderation. You can achieve success during this stage, as long as you maintain your diplomatic skills. TRANSITING JUPITER SQUARE RADIX ASCENDANT – On the whole you are feeling self-confident and are enjoying warm relations with other people during this period. However, you also find there are times when your energy levels are a little out of kilter. Perhaps you lack the energy to tack up all opportunities that come your way or perhaps you feel that others are not as appreciative as they could be of your need for fun and enjoyment. This is a time during which you need to monitor your energy levels and make decisions that are best for your health and happiness. This mean that you need to slow down a little and let yourself or others adjust to a pace that is realistic and assists personal growth. TRANSITING JUPITER SEXTILE RADIX VENUS – Lucky in love and money is a good catchphrase for this transit. You have opportunities to enjoy a happy social life, good relations with loved ones and possibly improved finances. You are content and happy with harmonious relationships. You need to make the most of these opportunities rather than let them slip through your fingers. TRANSITING URANUS QUINCUNX RADIX URANUS – This transit occurs around the age of 34, and again in your late 40s.During these times you face areas in your life that have fallen into ruts, realising that what was once comforting no longer offers true support. Consequently you decide to make changes that give you more of a sense of independence. In some cases it may feel that these changes have been forced upon you; however, if you are honest you recognise that deep down you felt that certain areas of your life were becoming a bit stale.At the age of 34 it is likely that you are saying goodbye to some final links with your childhood freeing yourself for true independence. In your late forties you are more likely to be reflecting on whether or not all areas of your life mirror your true self. TRANSITING JUPITER CONJUNCTION RADIX URANUS – You may currently feel like life is like a roller coaster ride, full of surprising twists and turns which offer both fear and excitement. This is a time when you are willing to try new things. In fact you may feel that you have no choice. Something is compelling you to take risks that you never thought you would. And woe betide anyone who stands in the way of your new-found push for freedom. You want to be left to your own devices, even though they may seem odd to those have known and loved you. They would be wise not to stand in your way. However, you would also be wise to show some restraint when appropriate. A complete disregard of rules and regulations can prove dangerous in some situations. Opportunities for travel, study, technical, esoteric and scientific pursuits may arise. TRANSITING JUPITER SQUARE RADIX MERCURY – Generally speaking this is a positive time during which you receive good news, positive outcomes to transactions and easy execution of your goals and plans. You are open-minded and eager to share ideas with other people. You are confident in your own opinions. However, you do have to be careful how you go about your business. On the one hand you are confident and optimistic and other people respond positively with special gifts, support and favours. However, you also have the tendency to be grandiose, lacking tact and diplomacy. In other words, if you are not careful, you can be opinionated and blunt. Others may be quick to point out these faults, which you find irritating rather than helpful. Before you know it your positive dealings have spiralled into a maze of mis-communications. This is easily avoided if you show some restraint in your communications with others. Once you have learned diplomacy then you are likely to benefit from anything that involves contracts, transactions, study, teaching, travel and the media. TRANSITING SATURN SQUARE RADIX SATURN – It is time to take a look at the structures in your life. This can range from the smallest of details such as your daily diet through to larger matters such as the house in which you live. Do the current habits and structures of your life still suit your life choices? Perhaps your feelings, family or work has changed and you need to adapt accordingly? This can be a testing time if change or settling down is a challenge to your nature. Aspects of your life which once seemed to offer safety and security become less sure during this period. It may be that you are viewing these areas differently, or it could be that someone else is shaking things up. Either way you are being forced to reassess your plans and purpose, leaving behind any ineffective support systems. The good news is that you can now build new support systems that boost your sense of purpose. cont’d (the date span is four years).